Carmarthenshire Fungi: Calocera cornea and Glyphium elatum --- some spikey-looking fungi. Calocera cornea and Glyphium elatum --- some spikey-looking fungi. On a recent morning dog walk I found a series of 'spikey' fungi. This Small Stagshorn, Calocera cornea, was the first. On a fallen branch of a small oak. This jelly-fungus is very commomon and found on wood of various broadleaf tree but rarely on conifer wood. Another common name is 'Finger Jelly'. I must have passed by this apple tree in the Country Park on countless occasions but had missed these 'spikes' of an Ascomycete until now. I have seen them on Willow (Salix) at the Ashpits woodland between Pembrey and Burry Port. One needs to look at small half-dead branches at eye level. They remain all year and, in fact, are present on the same branch for many years ---- or until Council staff tidy up low branches ! 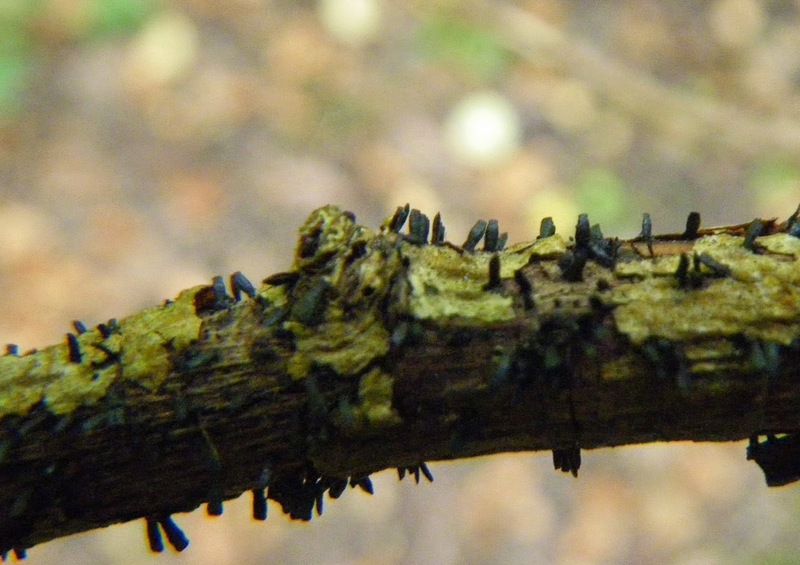 Each 'spike' is up to 2mm tall, chisel shaped and has very long, thin spores (250-380x2-3µ). This is not a very common species but, as it is not conspicuous, it might be more widespread. Dennis, in his splendid 'British Ascomycetes', 1981, considered it as "one of the rarest European fungi, only found a dozen times in the past century and a quarter, only twice in the British Isles".